To celebrate Halloween we’ve opted for The Cramps classic I was a teenage werewolf. Here’s a fairly good quality clip from way back in 1981, when they played at the Mudd Club, New York. Happy Halloween. Three albums in and The Miserable Rich are really hitting their stride as one of the UK’s most innovative acts, mixing compelling story telling with chamber pop and most importantly some damn fine tunes. Miss You In The Days sees singer and songwriter James de Malplaquet and the band’s string ensemble tackle the ghostly themes of possession and haunting. But this is not just lyrically. The production setting, in a haunted pub attic in the grounds of Anne Boleyn’s home Blickling Hall, and the Halloween release date also add to the spooky feel. It’s a well thought out theme that avoids the pretence of many concept albums, and while the tracks are mostly sad there’s an epic quality that prevents the album becoming downbeat. It’s probably their most complete album yet, demanded to be listened to as a whole, rather than to cherry pick tracks, as perhaps listeners may have done on their previous two albums. Among the highlights is the swirling Ringing the Changes. This waltz conjures up the themes of possession and haunting perfectly with the dancing protagonists spinning increasingly more wildly in each others arms as the song builds momentum. You can almost see the spectres and vampires dancing around. Another is the first single One A Certain Night, the key track on the album on the theme of possession. While the music is still focused on the band’s central instruments of cello, violin and piano there is a greater use of electric guitar and drums than on previous releases. This fills the gaps nicely and gives tracks such as opener Laid Up in Lavender an added dynamism. There’s also some fine melodies, with the chorus of ‘Honesty’ perhaps the best example of this. In terms of tunes, playing, singing and having a strong sense of purpose Miss You In the Days ticks all the boxes. It just staggers us that a band this interesting (and named one of our Top Ten Bands To Watch Out For in 2011) still has to put out its begging bowl and raise money through pledges rather than through the pockets of record labels. As the instruments build up on tracks such as Honesty I can’t help but wonder what they could achieve with a wad of record industry cash and perhaps a full orchestra at hand. Maybe in another life that’ll happen. Darren Hayman may well be the busiest man in indie pop (not a perfect genre label for him, but it’ll do). He recorded an song a day in January, oversaw the Hefner re-release programme, worked on the Vostok 5 album and exhibition and has a string of forthcoming releases planned out. His latest release is a quiet and thoughtful set of songs played on a ship’s piano, a cheap folding piano that was used on-board boats prior to arriving in Hayman’s possession. The album comes with a back story, that of an attack that Hayman suffered in November 2009. This attack left him with physical injuries (a fractured skull) and a need for quiet music to help in his recuperation. This album is the output of that need, and is a soft, understated, calm and (in Hayman’s words) “…round and smooth like well worn pebbles”. Opener ‘I Taught You How To Dance’ has all the trademarks of a classic Hayman love-song, the slightly awkward honesty would sit comfortably on any of his early Hefner records. The arrangement is just lovely, vocals, piano and soft drumwith a Steve Pretty trumpet solo lifting the middle section. ‘Old House’ is even more plaintive, and the lyric “My hearts with the keys by the door” is as effecting as anything he has written. ‘Cuckoo’ is another slow burning love song, but in the context of this album it is loud and lively, a chorus of friends adding their voices in the coda. The album is less obviously thematic lyrically than his other recent albums (excepting the January Songs project) although love and relationships make up the bulk of the songs here, and few songwriters depict relationships better. Musically it is one of the most cohesive works of his career, his voice and the piano are at the centre of every song and that makes for exactly the kind of calm, smooth and therapeutic listen that he craved. ‘Know Your Place’ and ‘Clown Sky’ are both atmospheric (although very different) instrumentals, and demonstrate that a career in independent film soundtracks could beckon if he decided to add another string to his musical bow. There really isn’t a bad (or less than good) track on the album, and to individually review each and every track on the album would make for a very dull read. Regular visitors to this site will know that we rate his work very highly, he has sat high in every one of our end of year charts. So to say that this album sits up with his best work is high praise, and I wouldn’t be surprised if he makes the end of year chart yet again. Fortuna POP! are celebrating their 15th birthday with a set of gigs at London’s Scala between the 1st and 3rd of November. Details of all the gigs are below along with the chance to stream selected tracks from each of the artists. 15 Years Of Fortuna POP! – Nov 1st, Scala, London by Fortuna POP! 15 Years Of Fortuna POP! – Nov 2nd, Scala, London by Fortuna POP! 15 Years Of Fortuna POP! – Nov 3rd, Scala, London by Fortuna POP! This latest EP from Protectors features two brand new tracks and two re-mastered songs from their debut LP, Can’t Shake The Moves. The Leeds outfit have already supported The Cribs, Frankie & The Heartstrings and Los Campesinos! promoting their debut LP, and listening to The Stem & The Leaf there is no reason why they cannot help strengthen the northern indie rock cause. The opening song ‘Overtime’ is a bouncy sing-along that sets the feel good tone of the EP, with singer Chris Charlton’s voice rising above the rolling drums and guitar. There is a warm familiarity even on the first listen of this song which is no bad thing, meaning that on the second and third listens it is hard not to tap your foot and have a little sing when the chorus kicks in. The same can be said for ‘Honeymoon?’ which is slower and more melodic, reminiscent of some of the more recent songs by The Cribs. The jolting drums and the holding of awkward notes combined with the catchy chorus, make this the ideal song for joining the band in their love of rambling and real ale. The third song on the EP ‘Corousel’, has more of a youthful attitude to it with more of a punk rock feel, as if an early Greenday had grown up in Headingley. ‘Woe betide’ sings Charlton. Despite the get up and go song title, the re-mastered ‘Shake The Moves’ is a relaxed end to Protectors first release with Philophobia Music, and the lyric ‘Surely worth a listen’ just about sums up ‘The Stem & The Leaf’. The songs are well written and the melodic catchy choruses will help make the coming winter months just little bit more jolly. Lullatone, the Japan based musical and new media duo of Shawn James Seymour and his wife Yoshimi, delighted us in March 2011 with the release of their short electronic instrumentals album called Elevator Music. Six months later they are back with a far more ambitious set of tracks, called Soundtracks for Everyday Adventures. This time there’s less of a focus on the machinations of elevator music and a greater emphasis on chamber pop, guitars and classical music. The most striking aspect of this new set is how similar the tracks sound to the Penguin Café Orchestra, the project throughout the 70s and 80s of the late Simon Jeffes. ‘The best paper plane ever’ in particular could have easily have slotted onto Jeffes Neonfiller Top100 Album from 1984 Broadcasting from Home, with its warm and floaty mix of piano, violins and mandolin. To be similar to Penguin Café Orchestra is no bad thing. They still find time to prove they are their own band though and there is the same Lullatone whimsy on this release that made Elevator Music such an enjoyable listen. ‘Growing up’ for example is unmistakable Lullatone, mixing a traditional Japanese melody, with acoustic guitar, a hint of electronica and a nice brushed drum rhythm. Other tracks have a similar sense of fun and are aimed to provide a soundtrack to our every day ‘adventures’, whether it be track 5 ‘Finding a leaf in your girlfriend’s ear’ or track 8 ‘Riding a bike down a big hill and taking your feet off the pedals. Lovely stuff again from one of Japan’s most innovative and friendly acts. For more information and to buy Soundtracks for Everyday Adventures click here. Butlins has denied speculation it was behind the rescheduling of Jeff Mangum’s ATP Festival at its Minehead resort. Festival goers who have already booked travel to the event were furious at the decision and ATP’s refusal to give a reason for the move. Butlins has already organised a 90s boyband weekender for the original dates, leading some festival goers to speculate the move was down to either a double booking or so that Butlins could run both events. Both these rumours have been firmly denied by Butlins. A spokesperson said: “I can confirm that it was neither a double booking, nor a request from Butlins that ATP move so we could put in a different break, that resulted in ATP moving their weekend to March. ATP are still refusing to disclose the real reason, only that the decision was not down to Jeff Mangum, who they say is also disappointed about the move. Butlins had previously already arranged a 70s weekender on the March 9-11 dates, but has said these will be moved to make way for ATP. The Butlins spokesperson also gives the first statement that the decision to move the event was ATP’s. The Butlins spokesperson said: ” When ATP let us know that they couldn’t do the early December break they asked whether they could move it to that particular date in March 2012. ATP will reveal on November 10 a list of those artists on the original bill that cannot make the new dates. It will also unveil some new acts for the revised bill. Already The Mountain Goats have ruled themselves out of the new dates, but Robyn Hitchcock has confirmed he will still be able to play at the festival. Flight of the Concords’ Bret McKenzie has teamed up with Joanna Newsom, Andrew Bird and Feist for the soundtrack to the new Muppets film The Muppets. The soundtrack will be released by Walt Disney Records on November 21, two days before its US release. McKenzie is music supervisor on the project and has penned four songs, including ‘Life’s a Happy Song’ which includes vocals from Newsom and improbably Mickey Rooney. Newsom also appears on a new version of the classic Muppet Show theme. Paul Simon also features, on the track “Me and Julio Down by the Schoolyard”. To celebrate the return of the much loved Muppets we’ve decided to give our run down of our top five ever Muppet musical moments. Edwyn Collins launched his new record label AED with an exceptional live performance from label signings and Neon Filler favourites Rotifer at a party held at Notting Hill Arts Centre. Analogue Enhanced Digital Records is the work of Collins along with James Endeacott, A&R supremo who found the Libertines when at Rough Trade and launched 1965 records- home to The View, but everyone’s allowed off days. Throughout October the label release a single a week, the second being Rotifer’s Canvey Island, released October 10. Rotifer’s sixth album is also due out on the imprint later this year. AED signings Broken hands and Wide Sea also made live appearances as well as Collins and Endeacott DJ sets, with extra showbiz pazzazz from cocktails mixed especially for the event- an Edwyn Collins, a New Morning Glory , and a not so appetizing sounding Rob Rot Roy. Despite being a fairly small venue and being first band on, Rotifer quickly filled the performance area within seconds of taking the stage- everyone had been milling around the bar sampling the cocktails obviously. 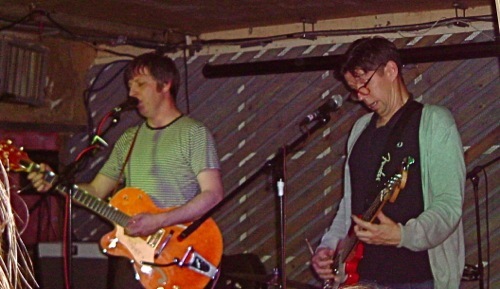 The trio, completed by Ian Button on drums and Darren Hayman- yes, that Darren Hayman- on bass, didn’t need to work too hard as they were preaching to the converted, but that didn’t mean they were about to hold back. Melodic 60’s tinged indie-pop is what was expected, and received, but Rotifer quickly dispelled any notions of twee as Hayman’s funky and somewhat erratic bass playing hugged the simple yet effective guitars. The Cosmonaut Who Never Flew in particular was one of those songs where story-telling and melody combine in a gentle poppyness, while maintaining melancholic understatement. Rotifer’s music is not exactly ground breaking, but when there are three musicians brought together by a love of indie-pop and melodies and oozing natural enthusiasm this barely matters. Chummy band banter was scarce but this freed up time for an unplanned song between The Frankfurt Kitchen and set closer Canvey Island, gifting the audience an unexpected treat. Rotifer produces gloriously simple indie which is timeless while acting as a compass to what AED hope to achieve. With help from other singings, Broken Hands, Wide Sea and Linden, and of course Collins’ and Endeacott’s contacts, it’s a label which is destined to generate a unique style and fan-base.